HOTROD I 've been writing "Interior Insights" articles for over three years now. Most of my articles have been focused on the business portion of the automotive upholstery industry. I've talked about everything from customer service, looking for new talent to marketing your business. Starting this year, I'll be taking a new and different direction on article topics. I plan on launching a series of articles that will deal primarily with basic auto upholstery. 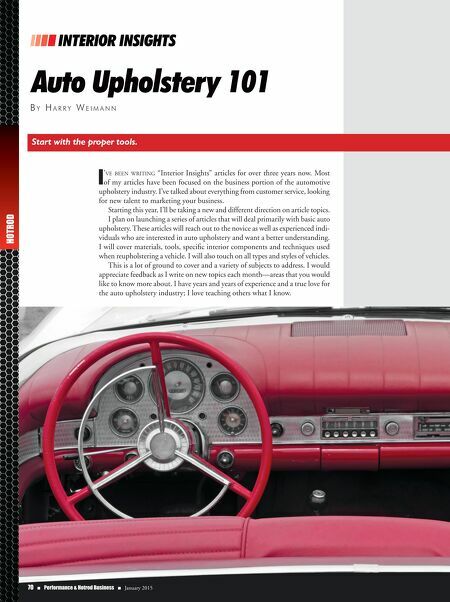 These articles will reach out to the novice as well as experienced indi- viduals who are interested in auto upholstery and want a better understanding. I will cover materials, tools, specific interior components and techniques used when reupholstering a vehicle. I will also touch on all types and styles of vehicles. This is a lot of ground to cover and a variety of subjects to address. I would appreciate feedback as I write on new topics each month—areas that you would like to know more about. I have years and years of experience and a true love for the auto upholstery industry; I love teaching others what I know. 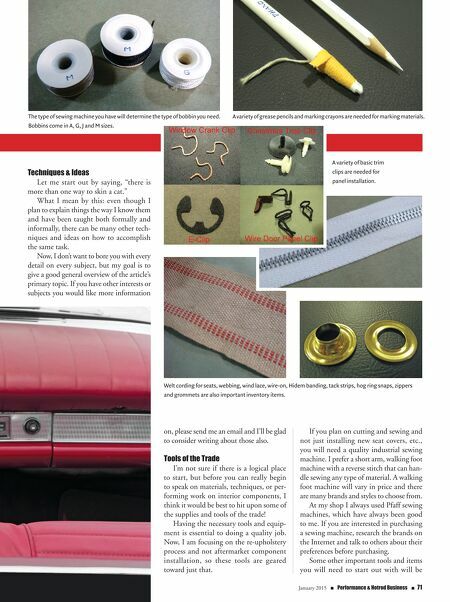 70 n Performance & Hotrod Business n January 2015 Auto Upholstery 101 B y H a r r y W e i m a n n n n n n INTERIOR INSIGHTS Start with the proper tools.